Change is hard isn’t it? Sometimes it rolls in like a soft mist blowing across tranquil open water, settling into the ripples with gentle motion as it lands on the shoreline of our souls. Or more likely, as it has often been the case in my own life, change comes like a crashing, crushing wave where you fight to shut the porthole of your soul as it rushes in. Occasionally we choose change –we think– but more often, change chooses us. We fight to find a rhythm and balance in life. But change –it shakes things up. It messes with mornings and afternoons and keeps us awake. It strips the controls -- or at least our illusion of what we think we control -- right out of our fingers. It jumbles up who we perceive we most deeply are. It's as if God uses change to remind us of who we really are and our utter dependence on who He is. We absolutely have the freedom, ability and need to make plans. Meal plans, education plans, marriage plans, career plans, business plans, five-year plans, and retirement plans. These are not bad things, but the raw truth is, too often our plans are for selfish purposes and a change in plans gives us the opportunity to seek God and His plan. I like to think I’m adaptable. In fact, according to a certain personality test, being adaptable is one of my top five strengths. That is honestly laughable. It seems like a conditioning thing. Something that has happened from sheer practice more than a gift or strength. What I know about change is that it's rarely what I expect it to be, never super comfortable and always occurring. Change strips away the layers of self-sufficiency. There are many people who appear to make great plans and make those plans happen, and to all of you –salute'! However most of us know that about the only thing we really have control over in this life is how we respond to change in our lives. This is usually the litmus test for where our faith truly lies. Too often I've bought into the whole rah-rah thing. That I am the master of my own destiny. That––try harder, work longer, do more and go more, so you can be more. The true Master of destiny sees the heart, not the performance and when it comes to difficulty and change? He doesn’t usually change our painful circumstances as much as He sustains us through them. I've read where people refer to change as a desert experience. We've certainly all known times in our lives where the heat of suffering presses down and stretches out before us, as we wander and wonder if this season will ever end. However this has been a year where the one word that found me happens to be 'deeper'. So the water analogy seems more fitting. And when I personally find myself in over my head, I tend to reach for God because there are simply no other options to run to. I'm not a speed swimmer. I think we may have discussed this. And the older I get, the more change happens and the less I want to be seen in a swimsuit. A little helpful information? Treading water is just complicated and exhausting when fully dressed. Change is most often uncomfortable because we are heading into uncharted waters.... which equals no control. This summer a few of us came together to study the book, Be Transformed, a commentary on John 18-21. Even though it doesn't sound that exciting, it was actually revolutionary in the way I read the Word. Well, one of Johns closest companions was Peter. Peter, that guy who was quick to speak and act and overtly passionate about all he did. Following Jesus turned out to be a wild ride that looked nothing like they thought it should. For instance, at one point, their journey took them straight into a storm. Jesus actually told them to get in the boat and go into that open water which turned into raging waves. And for a few minutes Peter forgot that people don't just walk on water. It's recorded for all of time that if we keep our eyes on Jesus, we can do the impossible. Perhaps you remember how the story goes? When Peter took his eyes off Jesus, only then did he sink and the waves began to overpower him. In the last chapter of the book, Peter decided to go fishing. So he and a few of his fishing friends spent the entire night working away and caught absolutely nothing. At least for them it was only a night, right? At dawn, Jesus shows up and asks them how it's going. I love that. And then Jesus tell them where to cast their nets. These men, who had nothing to show for all their hard labor, now pulled in a great harvest. That's how this faith life is. We need Jesus to show us where to cast our nets of energy, resources and time. It begs a few questions. What am I doing that is just being busy? What is truly important to do right now? Have I asked God where to place my net? And like the author Warren Wiersbe points out in his commentary, "....often we are not far from success. Maybe just the width of a boat." In different seasons God has removed things I've built my life, my identity, and my happiness around. The pain of those experiences continues to motivate me to hold loosely to things and to do what I do, for His glory. So now more change is arriving and I'm looking for His direction as to what is the next thing to do. Change isn’t about knowing the path, it’s simply about being obedient to take the next faithful step right where our feet have landed. –Even if we haven't landed on solid ground yet. Oh friend, may you enjoy the space between the rise of the wind and waves of change. But if you find yourself in this place where the water is rising, remember that God is unchanging and still in the business of calming storms. He knows the beginning from the end. 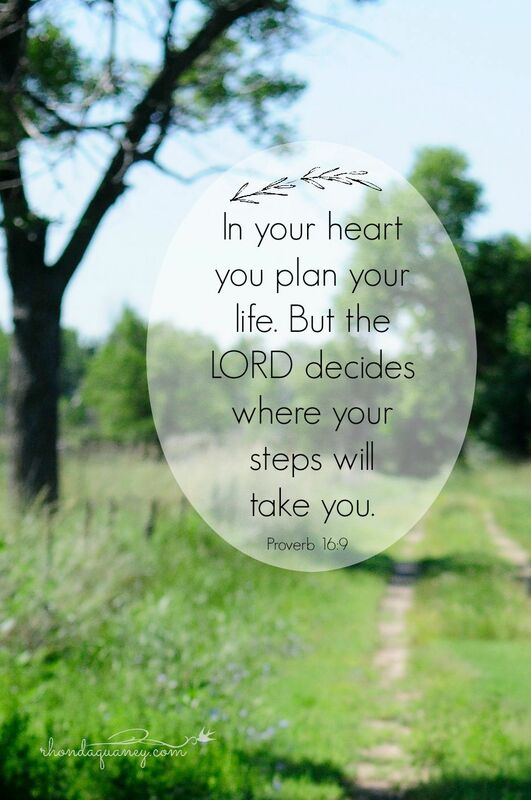 He has great plans for you. And you and I can trust Him even when the waves of this life threaten to overtake us. Sometimes change is actually a second chance. Another opportunity to come to a quiet, broken place where we can hear God’s voice. In that place, He is able to show us the path to take. I’m not ever going to be ready for now to be over. But the now I'm currently comfortable with was once a change arriving. The biggest change I will ever need is a change in heart. And honestly that is what change is usually all about. May we be people who step out of what we hold as safe and familiar so we can embrace the new season arriving. Together friends, let's keep our eyes on Jesus.